On Thursday it snowed! Finally. It wasn’t the best timing since Joel was flying back from a work trip that night, but it was snow, and I wanted it! The winter has been so sparse and brown, and when I looked out at the fragile white coating on the ground I literally felt what is meant by “a sight for sore eyes.” My strained retinas relaxed perceptibly, and something inside me that has been tight and knotted all winter relaxed and unwound just slightly. I’m a northerner. My heart aches for a real winter. I think you can see it in the photos too, that de-saturated grey light that comes with flakes suspended in the air. Today it’s drizzling, so the snow won’t last long. But it was there, and I was happy. But anyways, what was I here to tell you about? Focus. Focus. Reel it in, Emily. Ah yes, soup. These are a couple of the last bowls of my aforementioned bottomless pot of soup. I guess that means it wasn’t actually bottomless, if you want to get all technical and empirical about it. It was, however, a not insubstantial quantity of soup. And quantity is an important quality when it comes to soup. Provided that the soup is halfway decent, that is. And how many aren’t? That’s another good quality of soup – almost all of them are at least decent. This one, in my estimation, is considerably better than decent. It’s not a flashy or show-stopping soup. But it is kind of a tortoise of a soup, one that you’re happy to lumber through a whole week with. 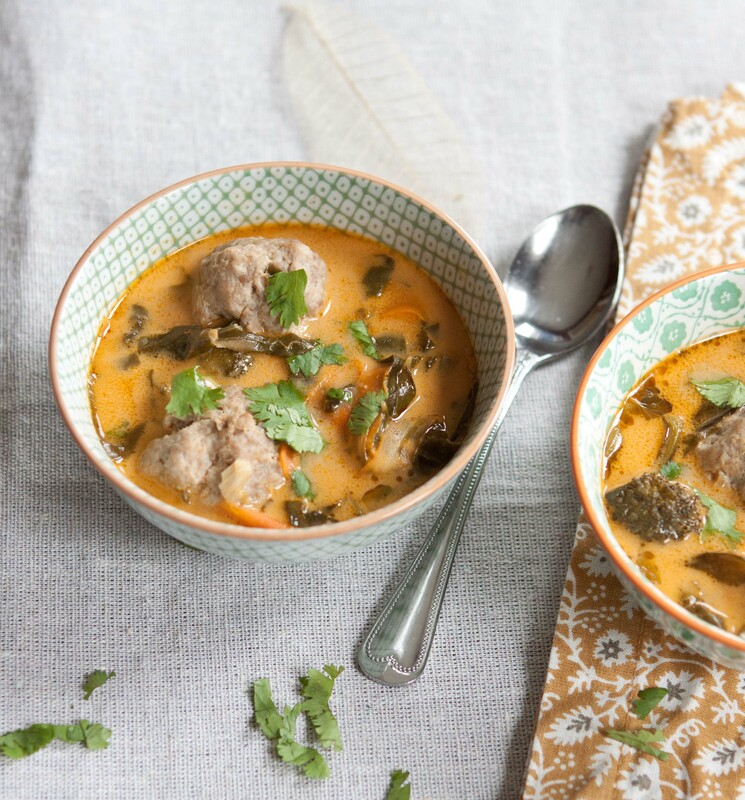 It’s a Thai curry and coconut milk soup, flavorful and satisfying. And, it has me thinking about something I recently read. Apparently sea salt is considered a rather crude ingredient in Thailand, and hot chilis from the Americas displaced peppercorns in Thai cuisine meaning that their equivalent of salt and pepper is fish sauce and chili peppers (especially in the form of a sauce called phrick naam pla). This is clearly an extremely badass culinary move. I mean, replacing the straightforward saltiness of salt with the potent, nose-mauling funk of fish sauce while simultaneously trading the playful floral tingle of peppercorns for the searing hot blast of chilis? The eating public of Thailand deserves a spot amongst the badasses of history in my book. Ok, back to the soup. Being Thai inspired, it does indeed contain fish sauce and chili peppers. 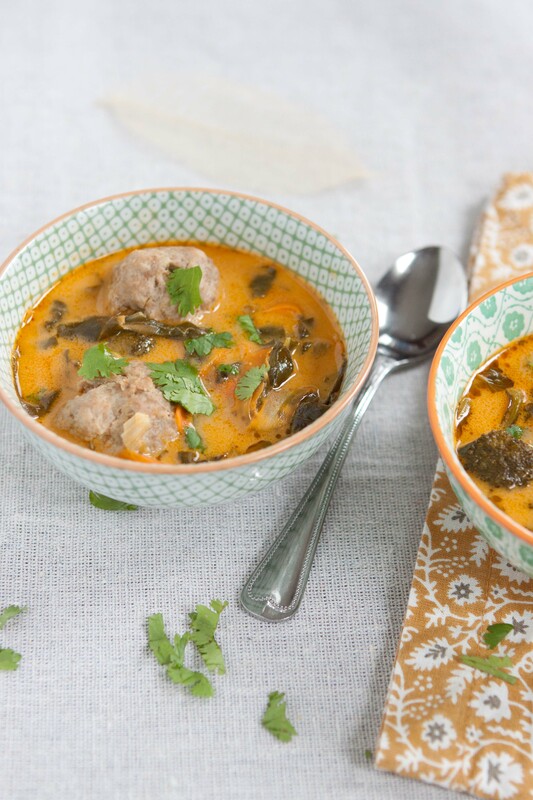 It’s also loaded with creamy coconut milk, curry paste, tangy lime and fragrant lemongrass. (If you can get lemongrass. If not, don’t fret. The soup will be different but just as satisfying.) 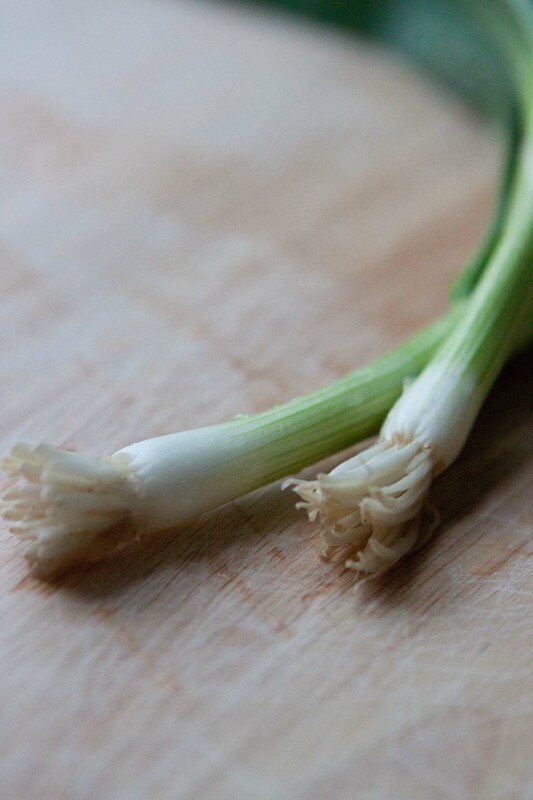 Grassy cilantro, oniony scallions, and a suggestion of maple syrup (Feel free to take a moment to feel aghast. Maple syrup is not remotely authentic, but it is tasty.) round out the all important sweet, salty, spicy, bitter, and sour quintet of flavors that characterizes Thai cooking. The soup is based on one I’ve had a couple of times at a friend’s house. I like it because in many ways it’s more a suggestion than a recipe. The base is there, but then you can vary the details. We had it with rice noodles and then not, and with any variety of vegetables, including cabbage, bok choy, broccoli, peppers, or carrots. In this most recent version, I used a vegetable peeler to create carrot noodles, which gave the slurping effect of having a noodle soup while sneaking in a few more veggies. I felt clever. 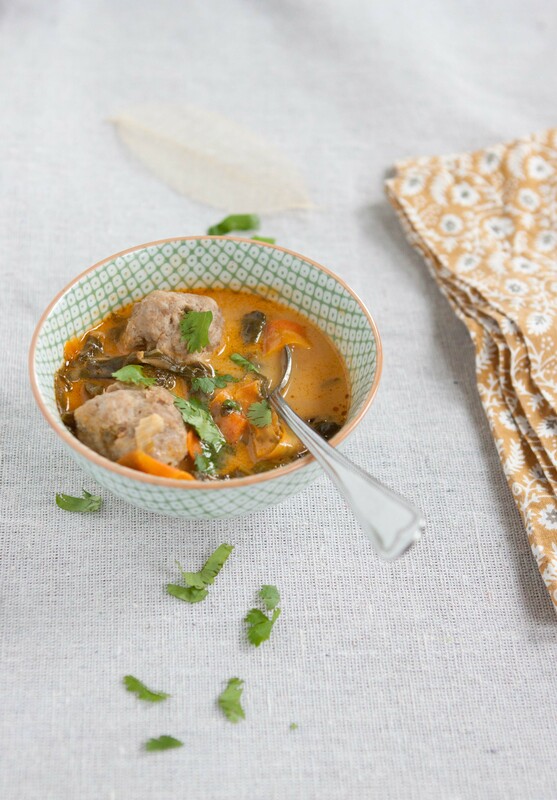 The one thing that is sort of fun and distinctive about the soup is the meatballs. It’s also the slightly questionable aspect. As my friend said herself, “it feels very Soviet Bloc to boil your meat.” I agree, yet it works. And, I find it less mentally jarring if I just think of them as little pork dumplings. Normally you wouldn’t want to bake your bread in a vat of water, right? But that’s what we do with dumplings, and we enjoy it. Plus, it’s how the meatballs are cooked in an Italian wedding soup. And, what’s good enough for the Italians is certainly good enough for me. It’s rainy. It’s a soup day. Here you go! I don’t know about you, but I’m always intimidated by Thai cooking because of the looooong ingredients lists. But, don’t be put off! They’re often surprisingly easy to find, and once you have them, the actual cooking is usually quite straightforward. In a medium bowl, mix together the pork with the scallions, about 1/2 Tbs. of fish sauce and 1 tsp. of grated ginger. Roll into small balls (somewhere between the size of a large marble and a walnut) and set aside on a cutting board or baking sheet. In a large pot, heat the oil over medium high heat. Add the garlic and the remaining ginger and cook for a minute. Add the thick cream from the top of one of the cans of coconut milk to the pot and stir the curry paste and the chopped chili into this as it melts. Cook until it begins to sizzle. Add the rest of the coconut milk from the can, plus the other can of coconut milk. Stir in the lemongrass (if using), maple syrup, the chicken stock (3 cups for a thicker,creamier soup, 4 cups for a soupier soup), the remaining fish sauce, and the carrot. Bring the soup to a boil, then turn down to a simmer cook, covered, for about 10 minutes. If you’re using two limes, zest and juice one and cut the other into quarters (with peel on). 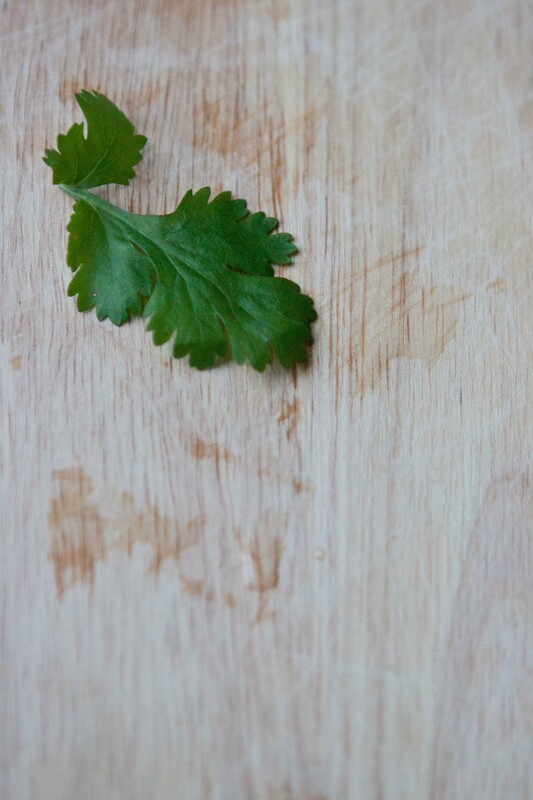 If you’re using one lime plus kaffir lime leaves, just zest and juice the one lime. Stir the zest, juice, and quartered lime/lime leaves into the soup. Gently add the meatballs, cover, and cook for 5 minutes. 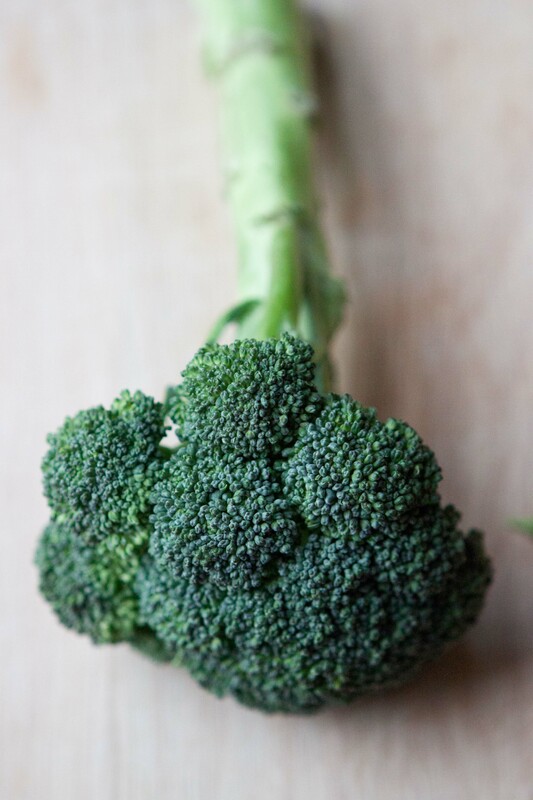 After five minutes, add the vegetables, put the cover back on the pot, and continue to simmer until the vegetables are tender, 5-10 minutes depending on what veggies you’re using. Once they’re cooked, stir in the half cup of cilantro. Taste, and season the soup with salt or fish sauce to taste. 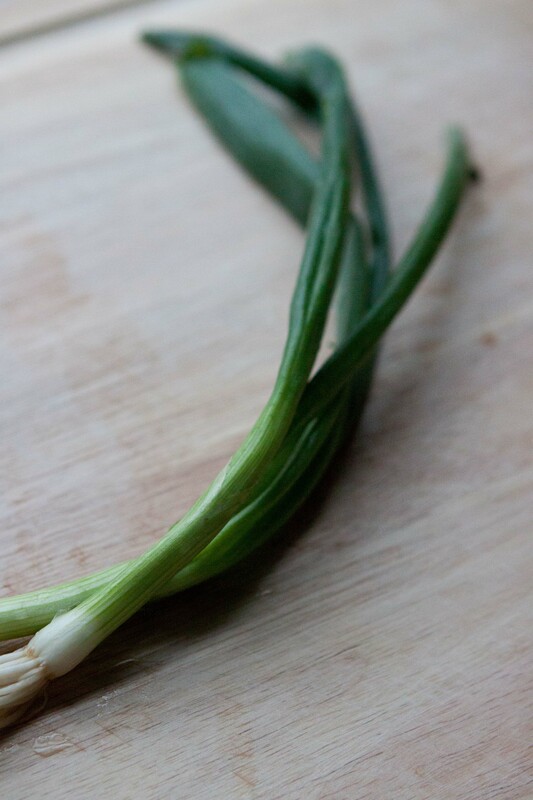 Remove the lemongrass stalk and the lime quarters. Serve accompanied by extra cilantro for sprinkling. I really like the idea of using shredded carrot in the soup, what a great way to squeeze in more vegetables. It makes sense though, since I use bean sprouts similarly! I look forward to adding this to my soup repertoire and adapting it depending on what’s around. Thanks! I hope you enjoy it. Bean sprouts would be quite nice in this particular soup too, actually! I just tried grating some carrot into pasta sauce the other day, but with a regular grater it was pretty tough. Maybe my vegetable peeler is the way to go. You could certainly give it a try. Sounds like you need a really good grater or else a food processor though. Having used a dull grater before, I know that it is extremely tough, and a huge pain! I’m so happy you got some snow! I think we must have gotten your winter here since we’ve had much more snow than normal this season. I adore Thai flavors and enjoying them in soup is one of the best ways. Your soup looks beautiful and delicious. Hmmmm, that is a really good question. It’s probably not one I’m that qualified to answer, since I’m not very accustomed to scaling recipes up for large groups. If you’re doing it as a soup course, I would think that you wouldn’t need a very large person, and it’s a pretty filling soup because of the coconut milk. So, I think I, personally, would double it, perhaps adding just an extra cup of broth or an extra can of coconut milk (for a very creamy soup) and making sure there is a meatball per person. The most important thing is to taste the seasonings as you go and add more curry paste, lime, and fish sauce to taste as you cook and adjust amounts. If you do that, I think changing quantities of ingredients will be very forgiving. I am new to your blog and am loving it. Your father recommended it to my husband and I (I am a patient of his). So anyway, I made this recipe last night and LOVED IT!!! I am a big fan of Thai cooking so this was right up my ally. I loved the addition of fresh lime! I used regular limes because I have a hard time finding kaffir leaves up here on the north shore of the big lake. Any recommendations on how to get them all the way up here? Thanks for sharing all of your wonderful food, photos, writing, with the world!!! Welcome! I’m so thrilled you’ve stopped by the site and that you’re enjoying it! I’m glad you loved the soup too. I’m afraid I have no idea how to get kaffir lime in the north country! I can’t even find them in Boston unless one of my friends brings them to me from her family’s tree in California. But, I know many places have Asian grocery stores, and those often carry the leaves. I’m on a coconut milk/lemongrass/ginger/thai chili kick lately, so this is right up my alley. It looks like a soup I’ve had before at this great little Thai dive near my office. Delicious. Awesome! Gotta love the feeling of being able make takeout food at home! this looks so yummy! I can’t wait to try this recipe! You are currently reading Coconut and Thai curry soup with pork dumplings at Five And Spice.